This article takes you through the steps of creating a job in Loc8 accessed via browser, while providing more details on the mandatory and optional attributes that you'll come across when creating a job. To learn more about job and its lifecycle in Loc8, read article Introduction to Jobs. To learn more about managing jobs in field, read articles on Loc8 Mobile. The tasks to be done at the customer location. If you're adding tasks from Library, the required Task Templates have been created in Loc8. If that's not done yet, please read Create Task Template. The assets on which tasks would be performed have been created in Loc8. If that's not done yet, please read Create Asset. Users for the involved members of your workforce have been created in Loc8. If that's not done yet, please read Invite your Workforce. STEP 1 If this is the first time you are creating jobs in Loc8, you can use the Getting Started section on your screen as a guide to creating your first job. To create subsequent jobs, go to the Jobs area. 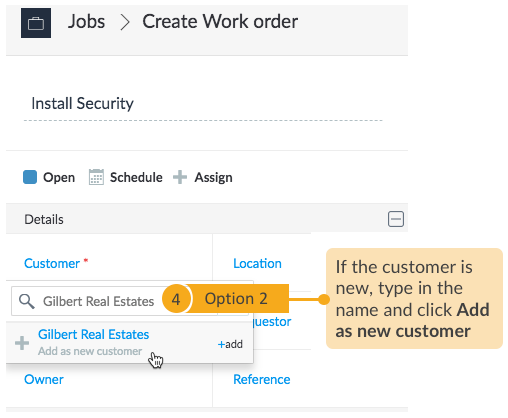 STEP 2 Open the job creation wizard and select one of the job types. 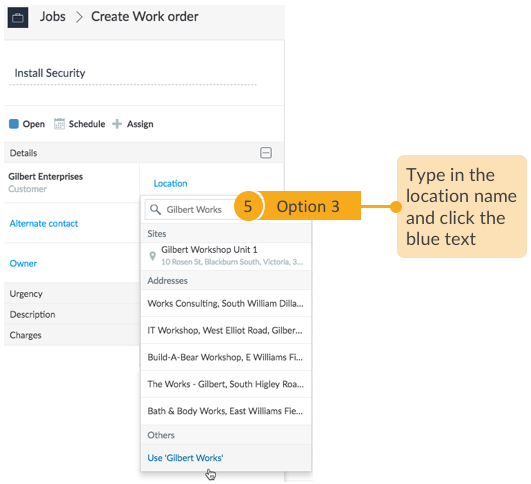 In addition to the default job types (Work Order, Audit, Inspection), you can also have your own job types to better align with your business terminologies. STEP 3 Fill in the subject and description for the job. STEP 4 Specify the customer who has requested for the job. Option 1: Select an existing customer. Option 2: Add a new one right from here. 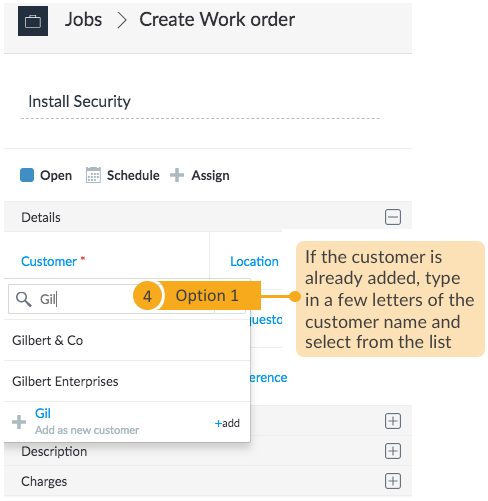 In the Customer Creation wizard, fill in the customer details, with valid email address as they will receive all job notifications on that email address. 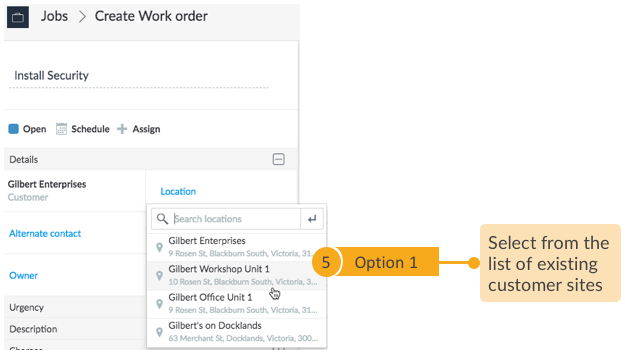 STEP 5 Specify the location where work needs to be done. 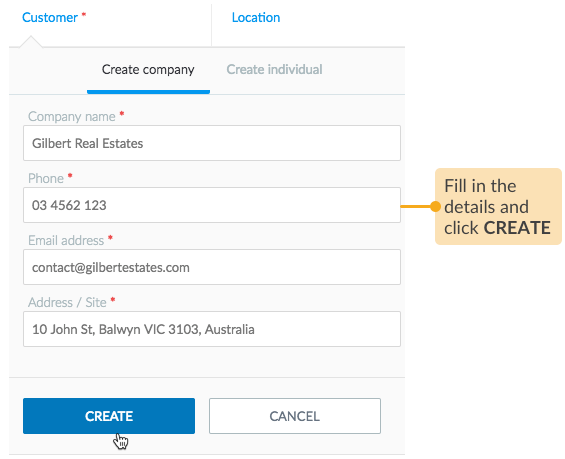 Option 1: You may select an existing customer site, whose address will automatically fill up here. 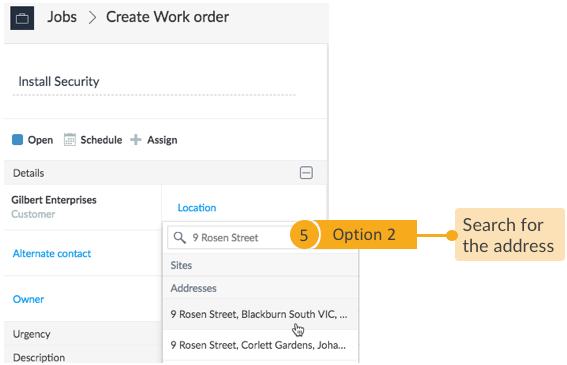 Option 3: You may type in a location name which could be just about anything that identifies the place where the job has to be done. For example, we may label just a portion of the customer's office as 'Gilbert Works' and that's where our technicians will perform the job. STEP 6 Specify the charges applicable to the customer for the works done in the job. 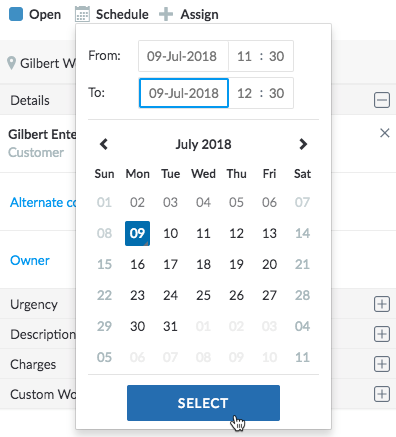 You have the option to charge the customer for just the tasks performed, or only the hours worked on site including the travel time, or you can charge for both labour and tasks. 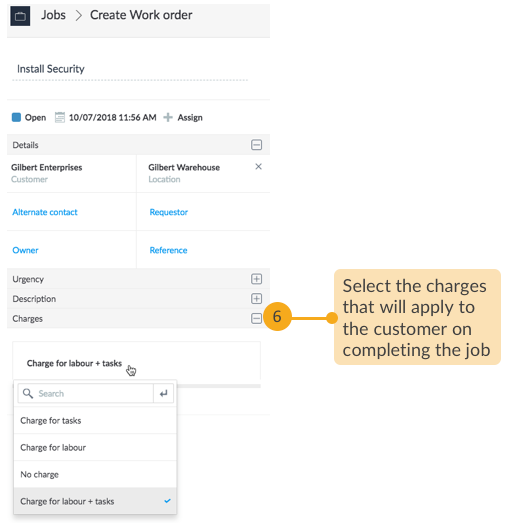 NOTE: The charge type once selected cannot be changed after the job is created. 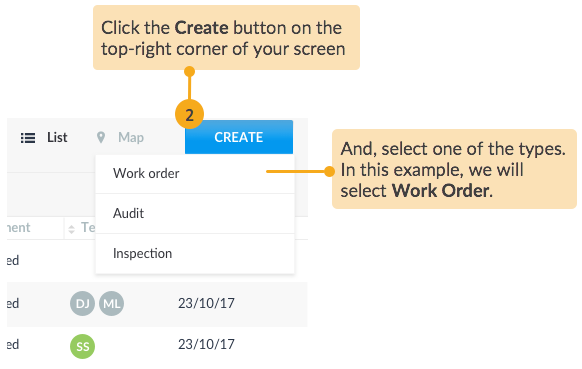 All the steps from here onwards are optional, though they help you to create a job with complete end-to-end details, ready to dispatch. If you wish, you may do them later as explained in View and Manage Jobs, and for now, directly jump to the last step to finish job creation. 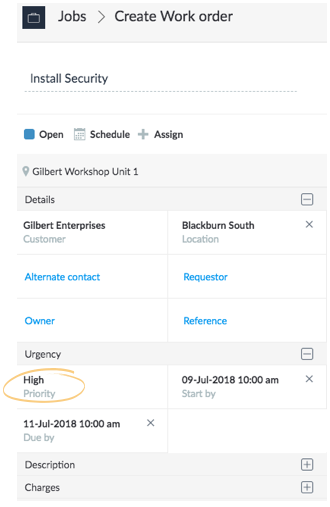 STEP 7 You can set the job priority to ensure the most urgent job gets picked up by your workforce first. 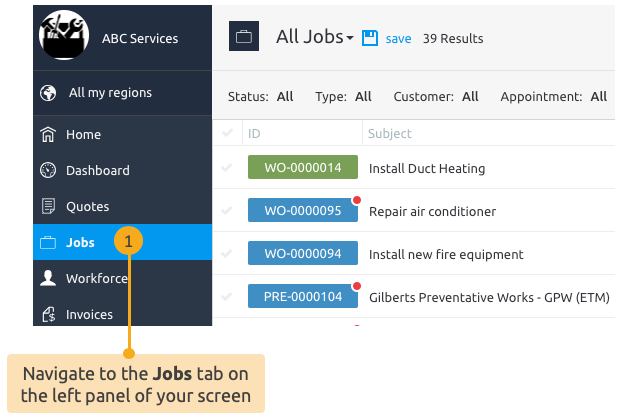 Priorities could be a selection criteria your workforce may use to filter jobs on their Loc8 Mobile app and action accordingly. 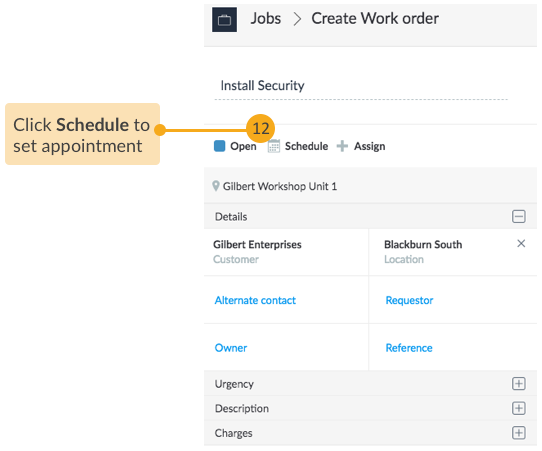 Set the calendar window indicating the date and time when the job can start and when it must be completed, based on which a set of appointments can be booked within this window to enforce on-time job completion. STEP 8 Select those involved in the job at some phase as either the Alternate contact, Requestor and Owner. 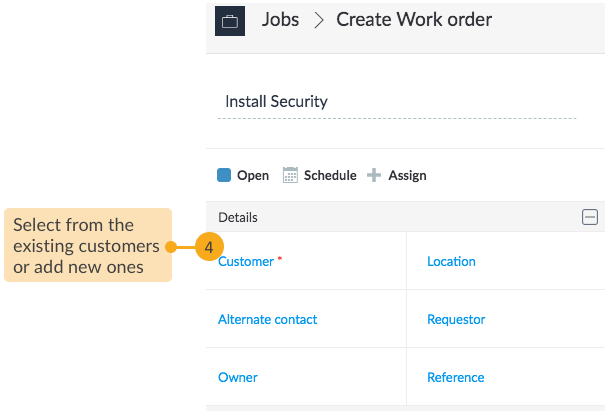 They could be a member of your workforce, in which case you would have already added them to Loc8, or people working for the company customer and whom you would have already added as contacts on the customer's profile. STEP 9 Type in a company-specific identification code, tag ID, serial number or any other convention practiced in your business so that you or your team can easily find the job when referred to it through the company-specific convention at any instance. A basic task is a one-off task. You can fill in the task details directly in the Item, Qty, and Unit Charge columns. Select the asset on which the new task will be performed from under the Asset column. 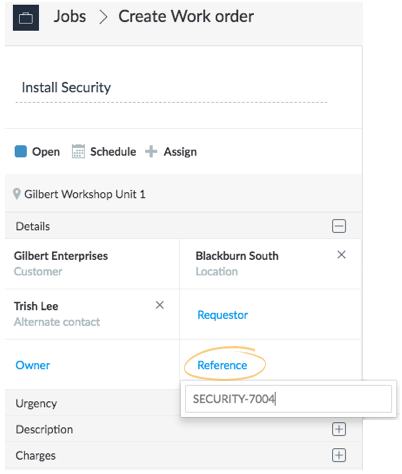 As a prerequisite, the required asset must have been created in Loc8, which you can do so in a new browser tab and switch back here to select it from the dropdown list. 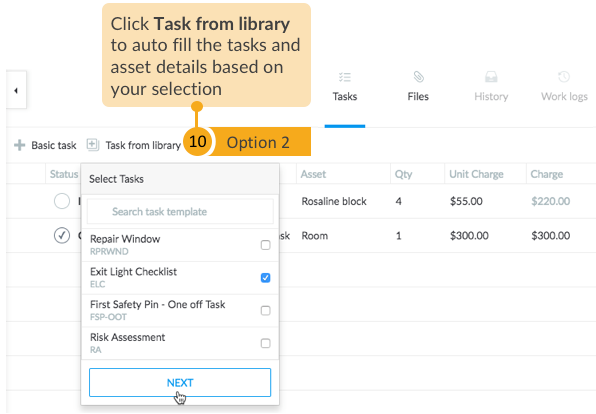 You can automatically add tasks by choosing the task templates stored in your library. Just pick the appropriate task template, and specify the assets on which the tasks will be performed, and the rest of the details will automatically fill up for you. 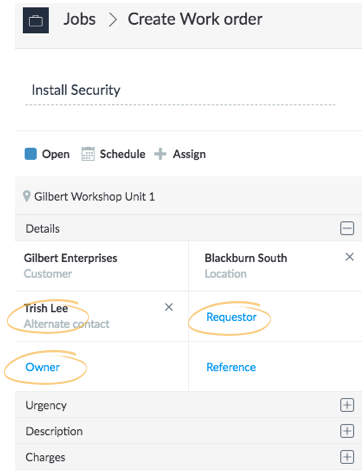 As a prerequisite, the required task templates and assets must have been created in Loc8, which you can do so in a new browser tab and switch back here to select it from the dropdown list. STEP 11 Attach reference files that may assist your workforce on their way or while on site under the Files tab. STEP 12 Set up a suitable date and time for the works to be carried out at customer location. 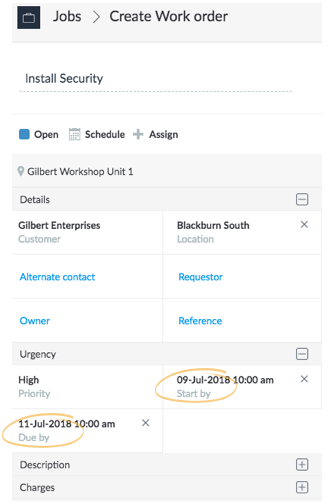 An appointment calendar opens up where you can set the duration of the appointment preferred to your team and customer. 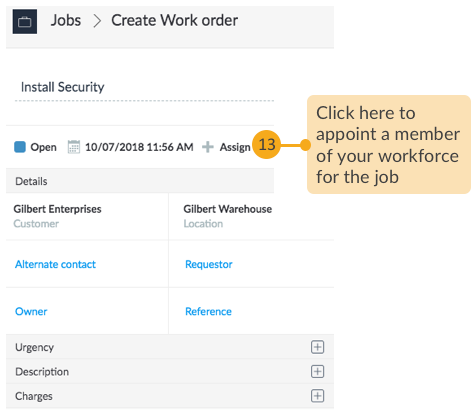 STEP 13 Assign the job to your workforce. Loc8 will suggest you an appropriate list of team members for the job if their trade skills and preferred region for working has been mentioned in their profile. If the required person is not added to your workforce yet, you can do that right now. 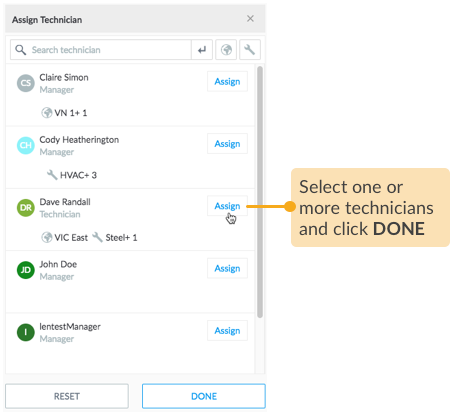 Just open your Workforce area in a new browser tab, and invite that person. To know more, please read Invite your Workforce. STEP 14 Lastly, go ahead and finalise the job. That's done! 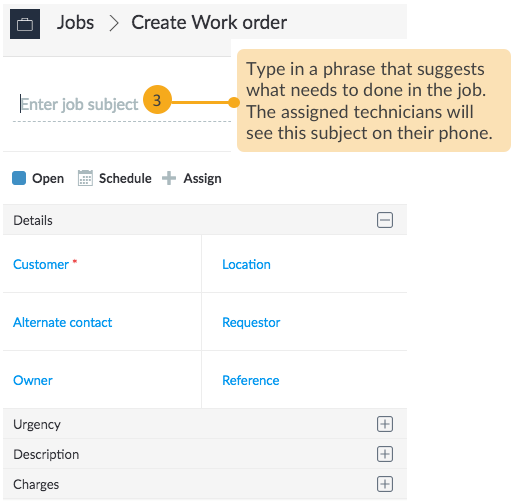 The job is now created and sent out to the assigned team members who can view the job in their Loc8 Mobile app, and log their works expenses, inventory and photos, which you can access and edit from browser. For more details, please read View and Manage Jobs.